Ahead of Avengers: Infinity War, the extended cinematic universe has been sweeping away its status quo—and questioning the very nature of superheroism. In 1986, the famed comic-book creator Frank Miller wrote a seven-part story for Daredevil called “Born Again,” a dark tale of betrayal and redemption that helped usher in the gritty modern age of the medium. Though Miller’s recent turn toward more extreme politics in his work has alienated many fans, his influence in the mid-’80s was crucial to the evolution of mainstream comics. 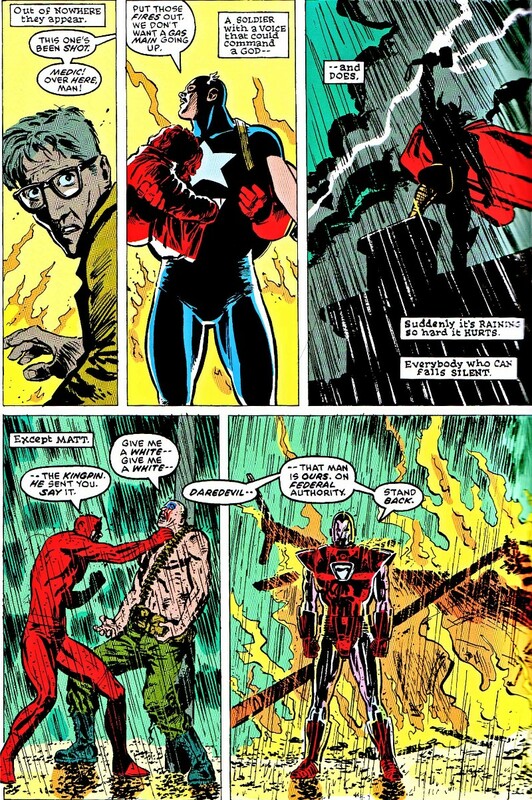 Near the end of “Born Again,” Daredevil, the costumed protector of Hell’s Kitchen, fights a villain named Nuke, whose powers are cataclysmic enough that more epic heroes have to get involved: the Avengers, represented by their best-known members, Captain America, Iron Man, and Thor. The artist David Mazzucchelli draws those three heroes in mythic fashion, with Captain America cradling an injured child in his arms, Thor silhouetted against the storm he has summoned, and Iron Man standing like an immovable sentry, collectively commanding Daredevil to back off. They’re powerful, but entirely inhuman—gods among men who are worlds removed from a street-level hero like Daredevil. With this scene, their grandeur had transmuted from something that was previously soapy and colorful to something remote and frightening. It was a clear sign of a necessary shift in comic-book storytelling, one that no longer easily assumed might made right. As the Marvel Cinematic Universe approaches its 10-year mark with the apocalyptic Avengers: Infinity War, its films have begun to move in a similarly dark direction. After kicking things off with stirring origin movies like Iron Man, Thor, and Captain America: The First Avenger, the series has gradually started to examine the shaky underpinnings of its heroic Avengers, and is now laying the groundwork for their calamitous upending. The villain they face is as godlike as they come: the alien Thanos, a massive brute in search of celestial power that he can use to wipe out half the universe. Infinity War promises to be a loud, clanging finale of a movie—and, because Marvel titles keep printing money at the box office, also a fresh start, a radical rebooting of much of the films’ staid world order. Maybe the best indicator of Marvel’s rapid changes over the past 10 years has come with the Thor films. The first, directed by Kenneth Branagh in 2011, is right out of Marvel Comics’ “Silver Age” (a period broadly defined as the 1960s). Thor is a straightforward origin tale in which the titular Norse god (Chris Hemsworth) learns the power of responsibility from his noble father, Odin (Anthony Hopkins), while also fighting off his crafty brother, Loki (Tom Hiddleston). But by the third film, 2017’s Thor: Ragnarok, Odin’s authority seems built on quicksand. He admits to his son that he was once a brutal invader, and that he betrayed and banished his warmongering daughter, Hela (Cate Blanchett), after having a change of heart that she disagreed with. One of the crucial scenes in Ragnarok sees the goodly painted ceilings of Odin’s Asgardian palace torn down to reveal murals of bloodthirsty conquest behind them. It’s a vague, fuzzy bit of commentary on colonialism, but beyond that it’s a message that Thor’s background doesn’t guarantee his heroism. Ragnarok sees the destruction of Asgard, and ends with Thor finding a new angle on his powers that comes from within, rather than through his bloodline. In Infinity War, he’s a battle-scarred, one-eyed warrior with no magic hammer to wield. The saga of Captain America has been even more pointed, reflecting in some way the changes that comic-book character went through in the 1970s as the Watergate scandal undercut public trust in America’s institutions. Steve Rogers (Chris Evans) is, after all, a kind of living symbol of U.S. moral superiority, a wartime icon dressed in stars and stripes who battles the evil Red Skull in 2011’s The First Avenger. But in The Winter Soldier, the 2014 follow-up, Rogers is disenchanted with the surveillance-reliant government he returns to, which he finds has been infiltrated at all levels by the evil HYDRA. In his third film, Civil War (2016), Rogers outright rejects the idea of institutional oversight and becomes a renegade. It’s an idea that recurs again and again in the Marvel Cinematic Universe—that established orders often can’t be trusted. This year’s Black Panther explores a similar theme as Ragnarok: The leader of the utopian Wakanda, T’Challa (Chadwick Boseman), uncovers dark secrets about his father’s (and his country’s) past, which drives him to reevaluate the romanticism of tradition and destiny. Even the more utilitarian Avengers, who exist without a leader and seek only to protect the planet from its greatest threats, end up creating more problems than they intend. For example, there’s Tony Stark (Robert Downey Jr.) accidentally inventing the cyber-villain Ultron (James Spader) in a backfired attempt to create a global security system. The “Silver Age” of comics, in which Stan Lee created almost all of Marvel’s most famous heroes (collaborating with artists like Jack Kirby, Steve Ditko, and Don Heck), were revolutionary in their time for their simple humanism. Heroes like the Fantastic Four and Spider-Man stood apart from DC’s Superman because of their flaws and foibles, their tendencies to bicker and make mistakes, and their potential for change. Still, they were largely do-gooders through and through, battling costumed heroes and bank robbers alike in the name of altruism and virtue. Later eras of comic-book writing in the 1970s and ’80s picked apart those same idols, this time digging into their inhumanity and their potential for arrogance; also increasingly on display were the gaping flaws of our own world (particularly a lack of faith in institutions). For the Marvel Cinematic Universe, which has now seen 19 films released with no sign of stopping, that emphasis on more complex storytelling, rather than just epic battles, may be the best way to keep fans invested in the long run. Sure, Infinity War promises death and destruction, but the most intriguing thing about the movie is that it has a real chance to topple the series’s status quo. Not just in killing off characters, but also in deciding what comes after that—and what the very notion of superheroism even looks like onscreen. In the comics and films alike, Thanos has always existed as an existential threat, a villain given the power to rewrite the universe with a snap of his fingers. Marvel honcho Kevin Feige has called him the “main character” of Infinity War. There’s a good reason for that—he’s the films’ engine of change, their way toward a murkier, more challenging future.